Arkham House, 1949; 186 pp. ; limited to 3000 copies. First edition. 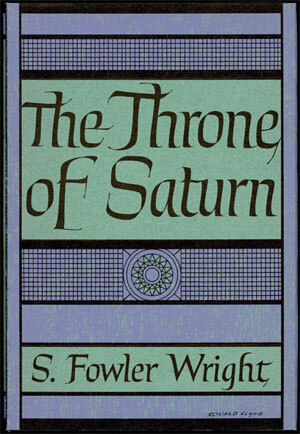 The Throne of Saturn is a collection of science fiction short stories by author S. Fowler Wright. It was the author's first American book and his only collection published by Arkham House. The book is an expansion of The New Gods Lead published by Jarrolds in 1932 by the addition of two stories. Book is solid and clean; black binding cloth is clean, bright, and unblemished; corners are very lightly bumped; gilt lettering on spine is bright annd clean; pages are clean and bright. Dust jacket front is clean, bright, and unblemished; flaps are clean and bright with original price ($3.00) unclipped. "The Temperature of Gehenna Sue"